The best Big Apple escapes, as selected by BACKPACKER Local scout Justin Bailey. New York City may be the ultimate in America&apos;s concrete jungles, but that doesn&apos;t mean you have to drive for hours to get your wilderness fix. Soaring views over rocky peaks, quiet lakes, steep scrambles, and wildflowers galore await on these five favorite trails from our Manhattanite scout, Justin Bailey. The best part? Every single one is within two hours of the city. This hike brings in some of my absolute favorite views of Harriman State Park, and while it’s a poorly kept secret among the hiking community here, it has still managed to stay off the radar of the masses. Be prepared for a moderately difficult day of ups and downs totaling about 3,000 feet of elevation gain. You’ll start on the Appalachian Trail headed east past the pond before headed up to the top of Island Pond Mountain. Cross over to the Long Path down to “Times Square” before headed back up to Bald Rocks and exiting back to where you came from using the Arden Surbridge Trail. An annual summer tradition hike with friends, I spend all year looking forward to this one. 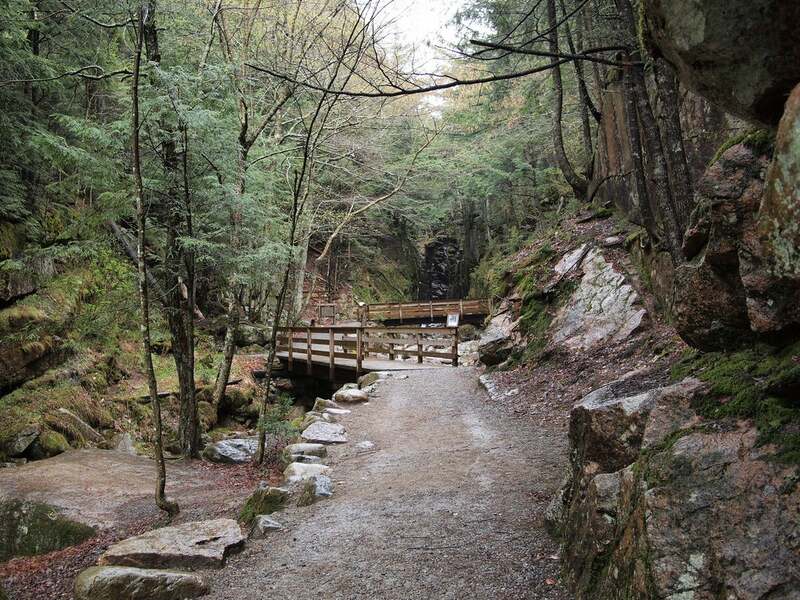 This hike is easy, and beginner or kid friendly. (The only difficult part of this hike is finding a legal parking spot, as officials have changed the trailhead and parking rules several times in the last few years in an attempt to cut back on congestion.) The trail entrance is just a hop over a guardrail and down a short but steep scramble to the riverbank. Once at the river, the trail is actually IN the water. It&apos;s waist deep at times but crystal clear and refreshingly cool, and you hit your first waterfall after about a quarter mile. It’s almost compulsory to take a leap from the top. Waterfall number two, about a mile in, brings a larger pool, makeshift rope swings, and bathtub-like rock features. Waterfall number three, about 1.5 miles in, greets you with a massive pool and grotto for the brave who swim behind the falls. Backtrack to exit from the trailhead. This is justifiably one of the most popular hikes around because if its extremely challenging terrain (2,500 feet of elevation gain) as well as epic views of the Hudson River. Start on the Cornish Trail with a few flat warm-up miles past the ruins of the old Cornish Estate, where you can take a moment to explore. A shortcut on Undercliff Trail brings you to Breakneck Ridge for arguably the most epic view of the Hudson available anywhere. Making your way across Breakneck to Washburn Trail you’re greeted with a second breathtaking view at the top of Mt. Taurus. It’s a gradual but rocky down hill back to the trailhead. Not a traditional hike by most accounts, this hike has no hills or breathtaking views. But it does have a lot of history and can be a fun way to spend half a day. The Old Croton Aqueduct Trail is a 41-mile-long but only 50-foot-wide state park that resides on top of the aqueduct that once delivered NYC’s water supply. You can start from countless points along the trail, but my favorite section starts at the Croton-Harmon Train Station. You weave your way south through neighborhoods, cut across school yards, and walk behind multimillion dollar mansions. You even walk across a beautiful bridge which once held the aqueduct pipe. This section ends in Tarrytown, where you can locate a few breweries and BBQ spots to celebrate your hike. This is my personal go-to hike in Harriman State Park, both because of its convenience as well as some cool views. It’s a quick, .25-mile hike along the road from the train station to the start of the trailhead. Where you begin climbing south along Kakiat Trail, a view of the town of Tuxedo will start to reveal itself as you make your way uphill. After turning onto Blue Disc Trail you’ll get three more great views, each in a new direction. At this point you’ve done the last of the 1,500 feet of climbing, and the Ramapo-Dunderburg Trail brings you back to where you started with a final viewpoint looking out over Tuxedo before dropping back down the the trailhead. The best local trails, as selected by BACKPACKER Local scout Stan Gentry. The best local trails, as selected by our BACKPACKER Local scout Scott Jones. The best local trails, as selected by BACKPACKER Local scout Daniel Nelson. The best local trails, as selected by BACKPACKER Local scout Erica Zazo. The best local trails, as selected by Denver Scout Heather Balogh Rochfort. The best local trails, as selected by BACKPACKER Local scouts Anastasia Allison and Jason Bickford. The best local trails, as selected by BACKPACKER Local scout Brad Stapleton. Traverse steep ridges and swampland north of the Big Apple. Explore bayside birding spots, forest-lined beaches, a historic army base, and the nation's oldest standing lighthouse on this 13-miler at Sandy Hook.